Let's be honest, as an online marketer, there's nothing that gives a better kick than watching one of your social media posts go viral. It instantly multiplies your brand's exposure and can give you just the boost you need. If you really want to use social media to your business' advantage over the long term, however, you need to do a little bit more than counting likes, shares, mentions and comments. The most effective tool in an online marketer's pocket these days is the ability social media gives you to really get to know your target market. This can be achieved by what has been termed social media listening, or social listening. While social media monitoring is the practice of watching and tracking trends, popularity, virality and the likes, social listening is about being tapped into the broader industry landscape to really get a sense of who your audience is, what they are talking about and why. This often gives you a much better idea of how satisfied or engaged your audience is, and what sort of sentiments they're expressing about your brand, as well as your competitors'. It also means looking further than just your followers' interaction with your brand or profile, to the overall industry and social landscape. This ultimately allows you to make better marketing decisions. By listening to your followers and getting to know their behavior, habits, likes and dislikes you'll be able to pick up on dissatisfaction, spot gaps in the market and improve your business strategy. 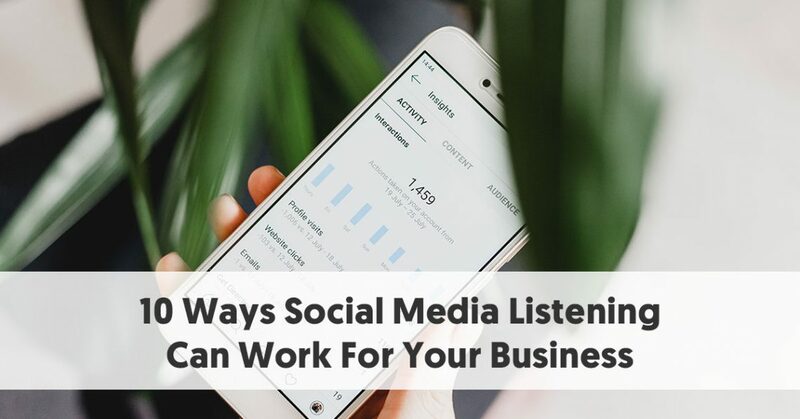 Whether your aim is to promote a product or brand, increase your social media following or tap into a new market, having a sound social listening strategy can be make or break for your business. One of the most rewarding benefits of employing a sound social listening strategy is that it allows you to identify where your competitors might be struggling or failing. If you keep an eye out for keywords that relate to customers' problems or frustrations with a competitor's product you will be able to pick up when there is a specific product that causes particular unhappiness and you'll be able to exploit it. For instance, set up your tracking software to show you keyword terms such as "[competitor's product] won't" or "[competitor's product] can't". You can then decide whether you want to ask people about their dissatisfaction or for more information about why they are frustrated. You can also tell them about the benefits of your own product and why it's a better option. Listening to where your competitors' weaknesses lie will also help you identify and troubleshoot any similar issues with your own product before it may cause unhappiness. Set up your tracking software to look for keywords that potential customers might use when searching for your product. Do this for various networks and platforms and where possible, engage with users to find out what it is they're looking for in the product. This is really market research made easy, where you have direct access to your target market. You can also ask them to suggest tips and ideas on how to improve your product or suggest new products or innovations they would like to see in the market. If customers know you're engaging and give easy feedback on questions, they will spread the word. While it might seem obvious, the best place to start listening for customer needs is actually in your existing list of followers. Put on your investigating hat and find out who your followers actually are. Follow them back to get a sense of what they're talking about. This lets you plug into the world of your audience and see your brand through their eyes. Remember, social listening is all about understanding what your audience cares about. Following someone back is the quickest, easiest way to get to know your people. Follow your followers to other platforms and networks. Just because your business only has pages on Facebook and LinkedIn, doesn't mean that's the only places your audience is active. In fact, most people use more than one social network. By following your audience, you could learn something about your customers and it could be an opportunity to grow your brand on a different platform. It's a no brainer! Social listening will help you find influencers who love your products. You can identify them with your tracking software or by doing a deep dive into your followers list. There are also great tools out there that can help you find the right influencers for your brand. Influencer Marketing Hub reviews all the leading influencer marketing platforms to give agencies and brands a better overview of features, benefits and pricing of the different solutions on offer and is a good place to start looking for influencers. Once you've identified them, reach out to them to start building relationships. You’ll also want to identify your biggest brand advocates. Reward them with special offers or giveaways or set up a product launch or event where you can properly introduce them to your brand. Continue to keep them engaged as your brand grows – this sort of organic marketing is priceless and you'll want to keep your influencers in your corner. One of the great benefits of social listening is that allows you to directly engage and build relationships with your customers. Most people find it easier to post a status on Facebook or Twitter than speaking to an automated call center or waiting for ages for a response to an email. By meeting their customer service needs where they are – on social media – you will inevitably provide a better customer care experience. Monitoring your brand and product names will let you stay ahead of the game in terms of catering to your customers' needs – whether it's a complaint you can handle before it gets too much traction, or answering frequently asked customer questions, keeping your ear on the ground for feedback from your followers and customers can really pay off. 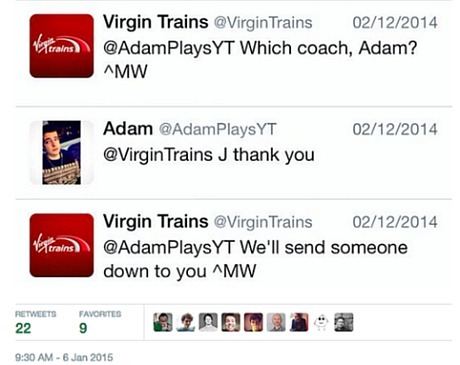 In 2014 Virgin Trains, had an excellent example of how to do customer service via social media right. One of their passengers traveling from Euston to Glasgow got caught without toilet paper when he needed it most. The passenger tweeted about it, informing the company about the problem. The social media manager was on it in a flash and responded to the passenger, providing him with toilet paper. Good social listening will also enable you to anticipate any negative virality that might be heading your way and, even more important, you will empower yourself to avoid any possible crises. When you're aware of sensitivities around certain topics, you'll be able to avoid putting any posts or content out there that might possibly offend your audience. Whenever you do have negative feedback on a large scale from your followers you can use your tracking software to investigate if the increased negativity has caused people to unfollow you or led to a dip in sales or fewer comments, or whatever metric you are interested in. This will allow you to make an informed decision about whether you need to take steps to respond to the negativity or whether it's simply a phase that you need to stick out. With the right social listening your business will benefit from broad knowledge about what is going on in your industry. You'll learn what your competitors are doing, as well as what isn't working for them. While you never want to copy someone else's social media strategy seeing what works for them can offer you some handy guidelines to use in your own strategy. Chances are that they are monitoring you too. Asking customers directly what they want might not be the best way to go about it, as you'll soon learn that many wishlists are unattainable. But by listening to what people say to each other about your product, you'll be able to pick up on what the most important purchase decision factors are for them. Customer review sites are also a valuable source of customer insights as recommendations and criticism here often include a detailed description on the product/service, which can influence consumer decisions. This can, in turn, be leveraged in product development to make sure you create exactly what your customers want. One of the best ways for businesses to use social media is to support marketing campaigns by encouraging customers to share content with a dedicated or branded hashtag. Branded hashtags are particularly useful for directing traffic to and creating awareness around your brand or campaign. Effective branded hashtags are short and specific, i.e. avoid any words or phrases that might have a double meaning. Make sure to check that your hashtag does not already exist as that will make your campaign less effective. 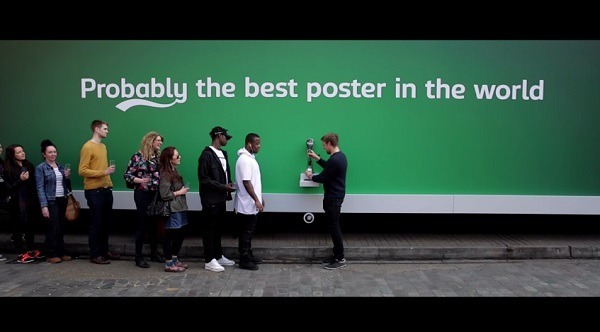 In 2015, Carlsberg unveiled the ‘best poster in the world’ in London’s Brick Lane – a billboard that dispensed free beer. It was an incredibly simple concept, but perfectly on-brand. Unsurprisingly, the stunt generated a lot of interest on social, with #probablythebest generating over 3 million Twitter impressions in just one day. In 2016 Audi Sweden challenged people to capture Instagram photos in remote locations, further than anybody else before. They used Instagram’s geo-tagging and photo sharing functions to automatically plot users’ photos on a map when they were uploaded with the hashtag, #CatchtheUnseen. The winner received an Audi Q7 car, which was actually what the brand was trying to promote. Encouraging users to post their own content about your product in a way that incentivizes them, is a very effective way to get UGC which an organic way to create hype around your profile or brand. It adds credibility to a marketing campaign as it is not paid for marketing and comes straight from the horse's mouth – the consumer. Aside from the explainer video and ad Audi created, this campaign didn't cost a lot of money. By using UGC you are able to compete with big businesses with a lot of money and big online followings without having to fork out the cash. Global IT company CISCO achieved a 281% ROI after implementing social listening in parts of the business. The company monitored how people reacted to specific keywords, products, and events online, and based on the collected data, they were able to determine what would be in high demand in the coming months. CISCO saved tons of money on expensive market research. What’s more, their prognosis was extremely accurate. By using tracking software you'll be able to spot trends in user attitudes, sentiments and behavior, and use that to maximize profitability. Don't go at it haphazardly. Gather the data so you have evidence to back your decisions. Your human resources department can also reap the benefits of social listening. It's often the super fans or product addicts that participate in online chat forums and blogs, and listening to these conversations can help you identify candidates with remarkable skill sets. Once you've found them, you're just a few clicks away from engaging with them and setting up an interview. It's head hunting made easy! But, even more important, people like to post about things going on in their lives and this includes when they are job hunting. For your HR department who is looking for highly qualified personnel, the internet is a source for endless opportunities. Job ads websites and networks such as LinkedIn employ social media as a recruiting tool.